Description: Enjoy an increase in speed and more power by utilizing the latest USB 3.0 technology for your workstation. 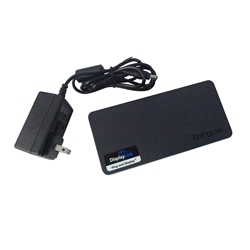 The Targus Universal USB 3.0 SV Docking Station offers a single video port that delivers beyond HD video and graphics up to 2048 x 1152 (DVI-I). In addition it includes a DVI-I to VGA adapter and 3 USB 3.0 ports for your USB 3.0 peripherals. The docking station also includes a Gigabit Ethernet port and audio in/out ports to connect speakers. An AC adapter and 2ft USB 3.0 cable are also included to help make it easy to connect your device into a complete workstation environment. Wifi Autoswitch Utility (For Business Users) Improve your network performance by offering your wireless users greater security in addition to the maximum bandwidth available. 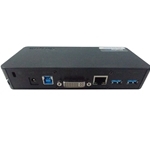 The Wifi Autoswitch Utility ensures that your office/desk users are connected to the wired LAN and reduces redundant network connections by decreasing the number of open ports and eliminating IP address conflicts.